Let’s now talk for a while about content marketing. Content marketing is not SEO, but it can be a part and when done well content marketing can turbo charge your ongoing SEO work of technical, keyword research, and link acquisition. We’ll talk about links in the next chapter, but first let’s understand what content marketing can do for your business and how to think of it as a SaaS marketer/owner. Content marketing is simply that – marketing your company through valuable content you are creating. For most companies, this often looks like blogging. Unfortunately, many SaaS founders are not marketers but rather developers or product people who know how to build a great product. Because of this, a SaaS company’s blog is often neglected. BareMetrics – with their Open Startups initiative. Content marketing does not have to be creating consistent blog posts week in and week out. In fact, I usually recommend that startups don’t do this unless one of their founders or early employees is very good at getting eyeballs onto content that they produce consistently. Instead, I recommend that most SaaS companies focus on larger resources that have the chance to reach a larger audience and catapult them from just another startup to being a leader in their space. Creating a large resourcewith the intent/goal of getting the attention of a lot of people because of its sheer size as well as capturing their email addresses for future marketing opportunities is usually a much better use of your time and limited resources. What type content should you create? The content you create is fully up to your time, your skills, and your goals. As I said above, if you love to create content then go all out and invest deep into consistent and in-depth content. If you want to get the most bang for your investment at the beginning, then I recommend that you invest in less but bigger content that will essentially market itself when you get it in front of the right audiences. This can be big guides, videos, and the like. They’ll spread more easily and gain more links than shorter blog-type content. Your content should always have goals. Beyond just pageviews and unique visitors, your content should also map to something much higher – revenue. The best metric for content success for a technology company is email subscribers. In fact, a lot of SaaS companies have used their email list to grow a great software company. Some examples of this are AppSumo (that now makes Sumo, the popular WordPress sharing plugin), Groove (mentioned before for their Startup Journey blog), and email providers like Drip and ConvertKit. I’ve been guilty of the “create content to drive audience” mindset without having a clear picture in mind of what to do with those visitors once they arrive. Once I started using content upgrades and directing visitors into different content funnels designed to take them to the conversion they are ready for (signing up to a tool, submitting a lead, etc) that’s when my business really started to grow. If you’re focusing on producing content, then set yourself a specific goal (10,000 email subscribers, let’s say) and focus down on that one metric. You’ll find that to get to that goal, you have to do things that are also good for SEO such as content creation and promotion. Producing content is a time intensive and challenging undertaking. I fully understand why many startups that are trying to get traction would rather spend money on advertising on Facebook than creating in-depth content. Content takes a long time to produce, and once you’ve created it then you still have all of the promotion work to do. If you’re committed to content as a marketing channel, then here’s how I’d do it. As I’ve said, if you want to get the most bang for your buck then invest in creating big content. 10x content, a term coined by Rand Fishkin, is something you create that is the industry leader. It usually takes a lot of time to create and has very high production value, but it stands out above everything else in the industry and can make your company a though leader in the space. All of these helped set the company apart from the rest of their industry. I think most resources and guides that people and companies create falls somewhere below 10x content, but is still much more impactful than “blog posts for SEO”. I would classify most well-produced ebooks and guides that are produced as 5x content because they take time to produce, but you can also do multiple of them per year and build a massive email list and follower base. I like to think that any 10x content is really 5x content that happened to push on a specific nerve and ending up spreading further than expected. 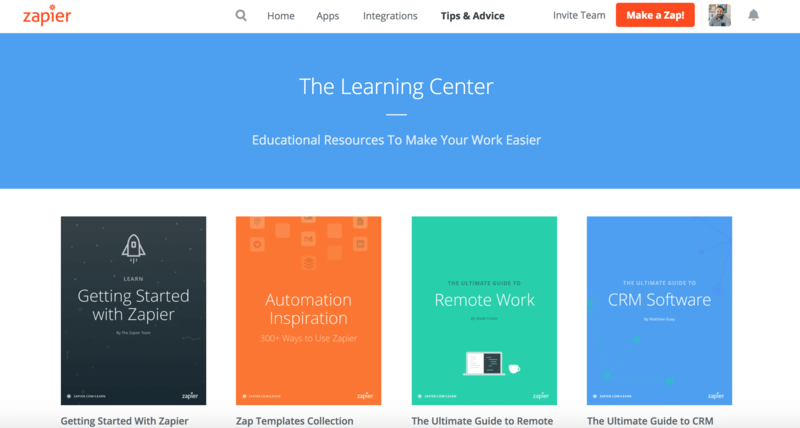 5x content examples are Zapier’s ebooks, Proposify’s template gallery, and Stripe’s Atlas guides. 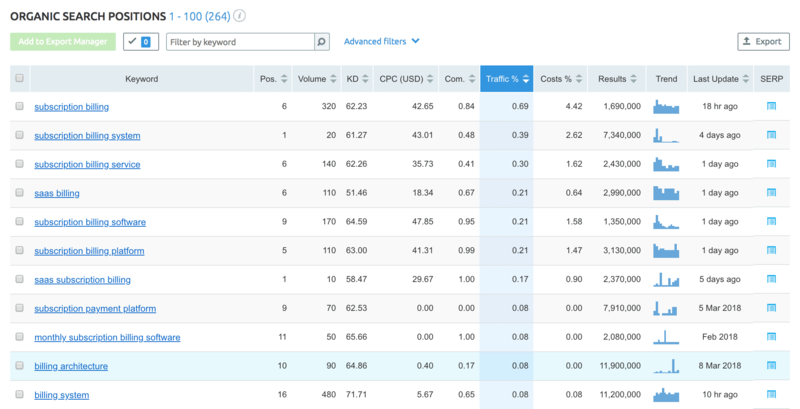 2x content is less than an ebook, but more than a 500 word keyword-targeted blog post. These pieces of content, which are usually just long blog posts that go in-depth on a topic, tend to drive an outsized portion of traffic to the site and rank for many keywords. While the look is not amazing and it’s not an “Ultimate Guide”, it does have varied content types (such as a video with founder Patrick) and goes into 21 different billing systems to compare them and help you make the right choice. That is solid 2x content right there. This kind of content can be created consistently, ranks well, and drives an outsized portion of traffic. They could also take this and rework it to be 5x content with a quiz and a download to drive even more business value. Where should your content live? Finally, let’s talk about where your content lives on your website. The right location for your content depends on what role it plays in your conversion funnel, how you are driving traffic and audience to it, and your technical capabilities. Most 10x content, assuming you have produced 1 or 2 major pieces that almost all of your visitors are going to want to read, there is an argument to put it in the top navigation or in a dropdown. Sometimes, this content can even be on your homepage in its own dedicated section. Most 5x content lives within a Learning or Resource section. This is a manually curated group of fantastic content that visitors can browse, though the reality is that this content is usually best served in targeted drip email campaigns. It may be discovered via search as well, which can then feed your email subscriptions if you offer it as a downloadable (which I highly recommend). Most 2x content lives on your blog. The challenge here is to help your user navigate through your blog to find your best content early on in their experience of your site. You can do this via a Best Content page/link in the top navigation or a Best Content widget in the sidebar. These pages can be both top of funnel awareness content as well as consideration stage content to send to people who you determine are thinking about using your product. Many startups start off with their blog on a subdomain, such as blog.startup.com. I encourage you not to do this. Many case studies have been published showing that moving from a subdomain to a subfolder has had a dramatic effect on traffic from search engines. This is hotly debated in the SEO world, but I firmly believe that if you want to give your content the best chance to rank well and be discovered then you should have it within a subfolder like startup.com/blog instead of blog.startup.com. I fully recognize the challenges to putting a WordPress (or similar platform) blog on a subfolder, involving reverse proxies and more often, but it is worth it to rank better and to minimize the upkeep required of another set of sitemaps, another Search Console profile, and needing to build links to that subdomain as well. Put your blog within a subfolder if you can.